Kekela Farm Market in Waimea. This farmers market is a bit different from any other on Hawai’i Island for a couple of reasons. First, it is located on a farm; and second, there are only two vendors . . . but don’t discount it because it's different. This market opens every Tuesday and Friday from 2 to 5 in the afternoons -- perfect for both weekly and weekend shopping -- and supplies an abundant variety of its own farm-fresh vegetables. Plus goat cheese, coffee, honey, fruits and vanilla beans from other producers. Produce display by Kekela Farm. The Kekela Farm is owned and operated by Paul Johnston, his wife Susan Sanderson and sister-in-law Betsy Sanderson, and has been in operation for eight years. Kekela Farm grows about 30 different vegetables in over 100 varieties, including a large assortment of colorful lettuces and other greens; different varieties of carrots and multicolored beets; gorgeous globe radishes, celery, cabbage, kohlrabi, broccoli and cauliflower; zucchini and yellow crooked neck squash; eggplants in different sizes, shapes and colors, as well as several varieties of tomatoes, onions and leeks. 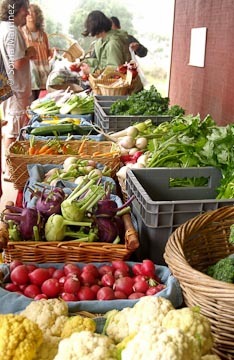 The produce is all neatly piled or set in baskets on long tables in front of the barn and sold by weight. On my recent visit I came home with carrots and beets in three different colors, leeks, zucchini, yellow squash and an avocado. Although the 3000 foot elevation farm follows organic and sustainable growing rules, it is not certified. Kay Cabrera of Sandwich Isle Bread Company. 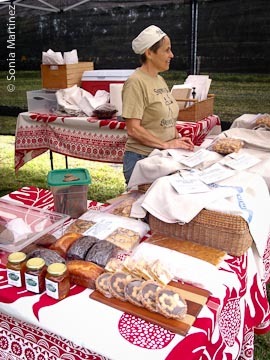 The other vendor at the Kekela Farm Market is Kay Cabrera of Sandwich Isle Bread Company. Kay and her husband Kevin, who call themselves “the itinerant bakers,” have been baking bread on the island for many years. About four years ago they decided to buy a dome shaped wood-fired masonry oven from France that they call “Matilda.” Matilda travels with them on a trailer bed to a farmers market on Saturdays, but doesn’t make an appearance at the Kekela Farm Market, although the selection of breads offered at their tent/booth is still warm from her oven! You can count on Kay and Kevin to have a large selection of bread and pastries to choose from; country white or wheat; multi-grain, pain Pugliese; Asiago cheese with cracked peppercorn, buttermilk, sun-dried tomato with roasted garlic, olive herbed bread and Challah are just a few of their offerings. All loaves run $7 and selections vary from time to time. Pastries and cookies too! The day of my visit there were some deliciously crunchy Kona coffee cookies I could not resist. From time to time Kay might have some locally made butter, so be sure to ask her. Sandwich Isles Bread Bakers can be found at this market on Tuesday afternoons only, not on Fridays. Both Kekela Farm and Sandwich Isle Bread Company can also be found plying their wares at the Waimea Town Market at Parker School on Saturday mornings. Kekela Farm Market is located at 64-604 Mana Road on the northern slopes of Mauna Kea. Head east from Waimea towards Honoka’a on Highway 19 (Hawaii Beltline Road), then turn right onto Mana road at the 55 mile marker, then left at the stop sign. Go 0.4 miles to the red barn (first left after Koa Lane), just before the curve.